GomMPPro is a high performance tick-based volume profile indicator, available for NinjaTrader 7 and 8 as well as Sierra Chart. It offers many visualizations, data smoothing, HVN/LVN, POC, VWAP, VA, and it features customizable hotkeys allowing fast toggle between favorite settings. When the data source is file, the file used is determined by the DeltaCalculation setting. If it is BidAsk, the indicator will record bid/ask "Gom" data files in "My Documents\GomProFiles" . If the computer or indicators are not running, there will be missing history data. If it is UpDownTick, the indicator will use the NinjaTrader tick files. To ensure their availability, there must be a chart based on tick data series running for the instrument. A tick-chart is any chart that is not minute or day based. In this mode the NinjaTrader setting "Tools/Options/Data Save chart data as historical" must be set to true. If the data source is "MinuteData", the minute data must be present, so if using a daily chart, please load a minute chart containing your full bar history to allow the download of the minute data. In any case, if there is missing data in the data source, a yellow alert message box will be shown and the missing bars painted in yellow. 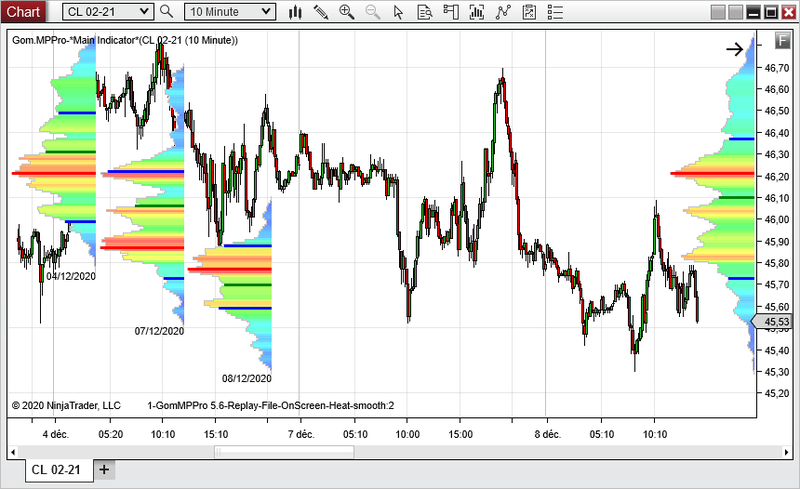 When the data source is file, the indicator will use the NinjaTrader integrated files, no more recording is necessary. However, the data series must be in "Tick Replay" mode. This mode must be globally enabled in NinjaTrader options, "Tools/Options/Market Data/Historical" : set "Show Tick replay to true"
Then on the chart data series, it must be checked. The Sierra version had a specific "Ticks per Volume Bar" that can be used on data series where there are gaps between price levels, to avoid a comb effect, like historical charts, that has only one tick every 5 which is actually populated, or on CFD charts like LMAX, where 1 tick on 5 is populated.